· Marinate chicken pieces with little salt,1/4tsp turmeric powder and 1/2tspchilly powder. · Heat oil in a pan, sauté the onion very well till it become mash . · add ginger garlic, green chili paste to it. · when the raw smell goes add turmeric, Kashmiri chilly powder,garam masala . · add tomatoes in to it. · sauté it until all the tomatoes become mushy. · add salt to it. · add chicken pieces and sauté for 5 minutes. · add 1cup of boiling water to it. · Cover the lid and cook for 2o minutes. 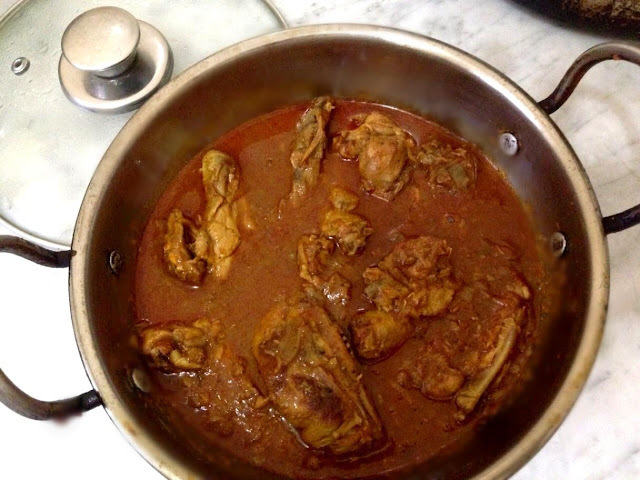 · Sprinkle curry leaves and coriander leaves on top of it.